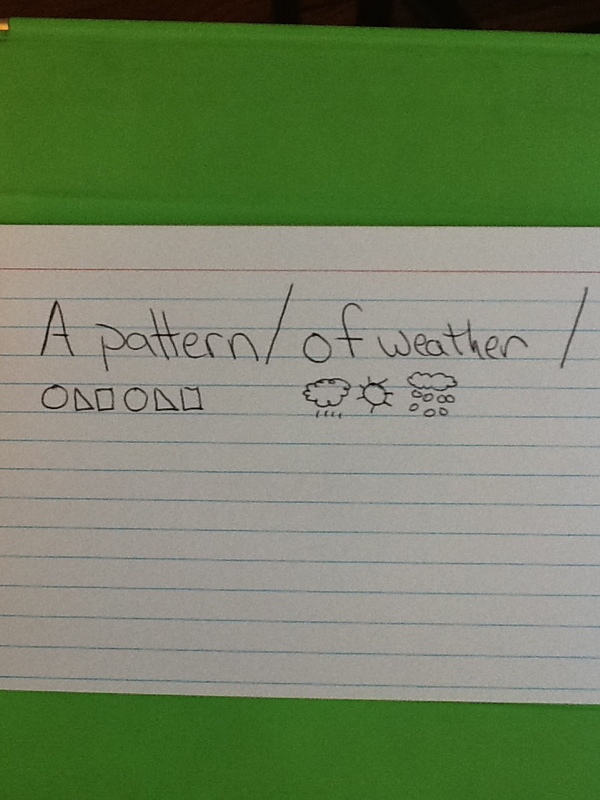 Deena shared some great techniques last week regarding vocabulary cards, which works for lots of students. I would like to share with you how we help our students with curricular vocabulary that have linguistically complex definitions. I have offered workshops in the Baltimore area for tutors and parents who want to help their students more effectively “anchor” curricular definitions. We’re so excited to have this opportunity to share on a broader basis! Students with language-based learning disabilities often have difficulty with the grammar of the language, and/or with linguistic flexibility. Students tend to focus in on “fragments” of definitions, often missing the overarching meaning (Scott and Nagy 1997) Or, they master the “gestalt” of the concept but fail to recognize the components of the definition if they are not presented in the exact terms they had committed to memory. During our speech-language sessions, it is not our job to ensure the student is “ready” for the test, but we use the student’s scholastic materials to teach vital strategies so that they can overcome this. We will walk you through one of our techniques using a recent example. 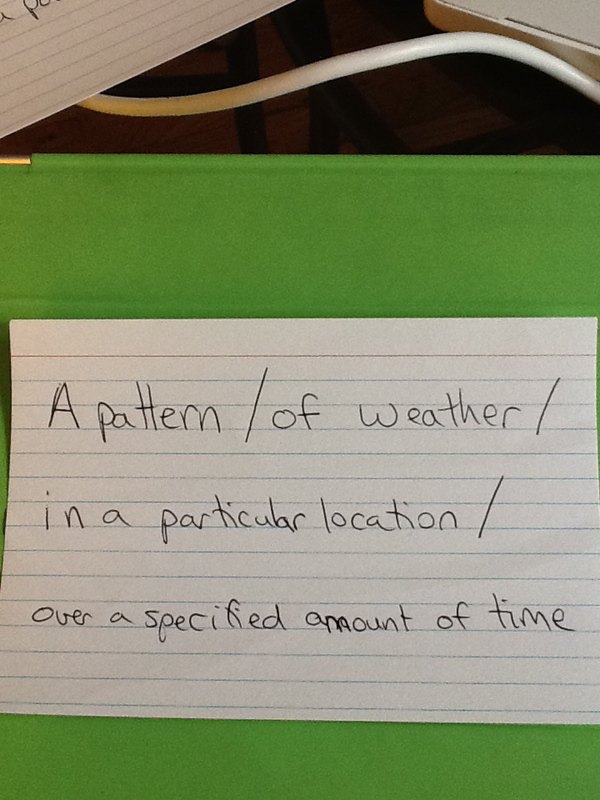 A 5th grade boy (we will call him John) came to me with a dozen or so geography terms he had to memorize. I will use “Climate” to show the process I used with him. 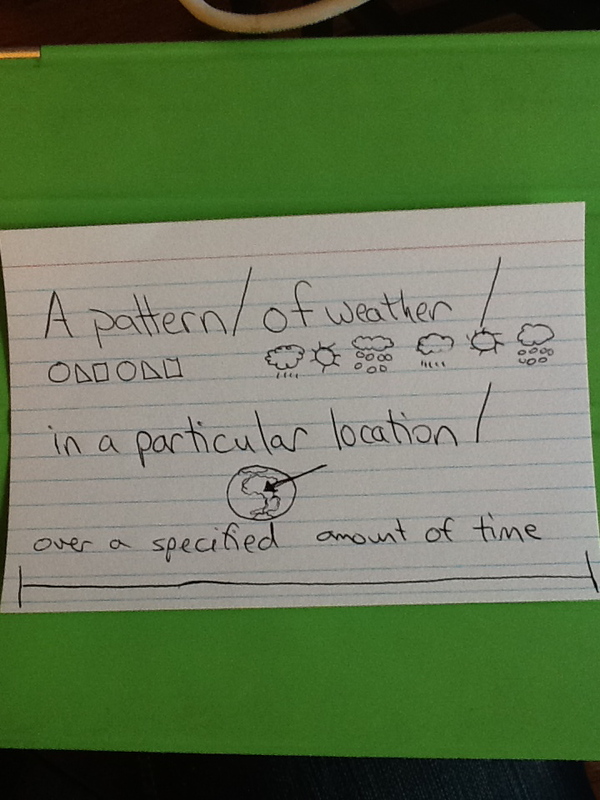 He had been asked to memorize the definition, “A pattern of weather in a particular location over a specified amount of time“. First, we discussed his background knowledge of the concept of climate. Like many students with whom Deena and I work, he was a bright boy who had absorbed the concept during class after discussions, watching film and engaging in class activities. Under the word CLIMATE, the teacher had asked the students to draw a quick picture of something that would trigger the idea of climate. He had drawn a sun. (Aside: I have seen this improvement in recent years–teachers are really getting the idea that visuals can help anchor information!) I take a slightly different approach, however. Because it is often difficult to draw one “quickie” picture that is meant to capture all aspects of the definition, I prefer to focus our artistic attention to the phrases within the definition, and address the word in a different way. This process went something like this. While I was drawing the shapes, I asked John to stop me when I had actually made a “pattern”. He stopped me the second I completed my last square. He understood the concept of “pattern”. 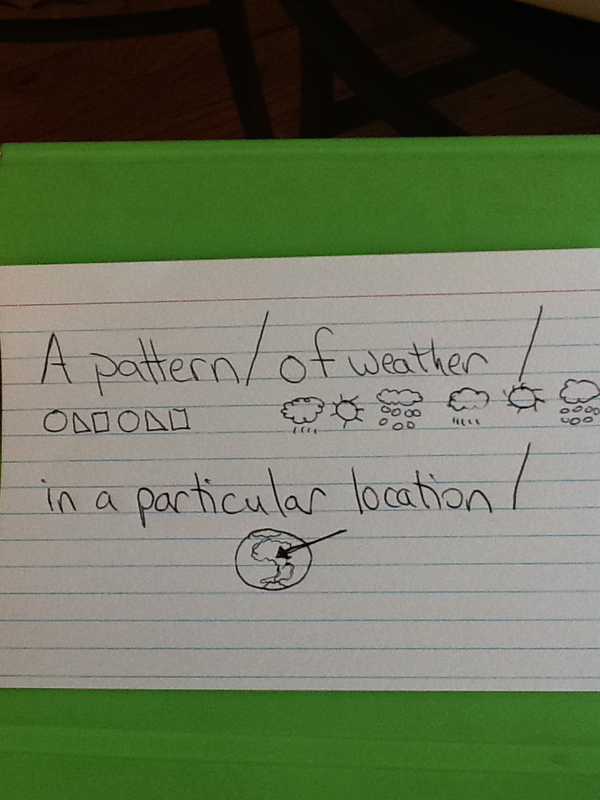 John transferred the picture concept to his index card under the phrase “A pattern” and I asked him, “But are we talking about a pattern of shapes?” “No, a pattern of weather!” “OK, so we should draw something similar, but use weather pictures instead of shapes.” He drew a raincloud, sun and snow, repeated and knew he was done. As I was drawing the “timeline” to represent the final concept, I asked him to direct me, and tell me when I was finished/how many years were passing. The term “specified” means someone is in charge of stating how long that time period is (weather experts). I wanted him to understand that, so I stopped the timeline when he told me to. Teaching linguistic flexibility is a necessity for our students. We have experienced great success with our students using this technique! If I ask my students (and their parents) nicely, I am sure we could upload several other examples of these curricular cards if the interest is out there!